Although the word "fluitje" literally translates to "little whistle", it is also used to denote a certain type of beer glass. The shape of the glass is a slender, slightly curved cylinder with a volume of 0.2 liter. In the south of the Netherlands bars tend to use a "fluitje" as the standard beer glass, but in the "Randstad" (see ‘Extra’ below) it is more common to serve a bigger type of beer glass, see ‘Related words’. 1. "Toen de spits werd getackled, blies de scheids onmiddellijk op zijn fluitje." 2. <in a bar> "Vier fluitjes alsjeblieft!" 3. "Hoe ging je wiskunde examen? Man, het was een fluitje van een cent!" ("How did your math exam go? Man, it was a piece of cake!" 1. "Vaasje": literally "little vase", but more commonly used to denote another type of beer glass, larger than a "fluitje". 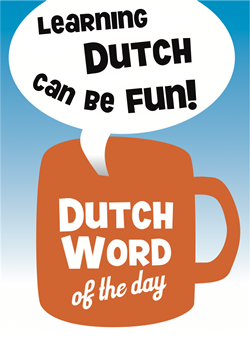 Also known as "een randje" (a little edge, because it usually has a thin golden line on the top edge), or "een Amsterdammertje" ("a little man from Amsterdam"). Warning: there is a bit of a vendetta between Rotterdam and Amsterdam. Hence, never order an "Amsterdammertje" in Rotterdam, but always order a "vaasje". 1. Randstad: the agglomeration in the west of the Netherlands at the ‘edge’ (‘rand’) of the country. It consists of the four largest cities, and the surrounding areas. The head of foam should be two fingers high. The consumption time of one glass is determined by an adequate balance between the shrinkage of the foam and the remaining fluid. When the foam has disappeared completely before the glass is empty, and the beer is already getting luke, it is said that the beer is "doodgeslagen" (deadbeat). The risk of a deadbeat beer is higher when the volume of the beer glass increases. For this reason beer connaisseurs often consider drinking from "fluitjes" more tasteful than drinking from "vaasjes". One who is only preoccupied with the mere consumption of volume, obviously goes for the "vaasje".